Available in 18 or 24 inch widths. Inclines and declines available up to 45 degrees. Used for various applications including high volume center discharge silo unloaders. Double chains are standard. Poly sections interchange With wood sections. Now available: Retro-Fit Poly Idler End. 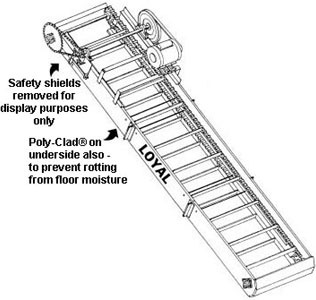 Poly idler sides available on all wood conveyors. Idler end slotted for easy shaft maintenance. Overall Width 19 1/2" or 25 1/2". Trough Width 18" or 24" or Trough Width 36" for maximum capacity needs. Poly floor is 5/8" thick. Available with chain tightener. Cast housing With wreasable bearings. 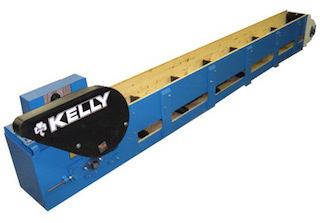 All wooden units are made with the poly sides on the idler for the removal of the bearing and shaft. #62 Detachable link with poly paddle. Overall Width 12 1/2". Trough Width 11". Overall Depth 9 1/4". Trough Depth 5". Lengths Up To 40'. 1 1/4" Diameter Drive Shaft. Cast sprockets. Greasable bearings. #67 Pintle chain and #50 Roller drive chain. Polyurethane on surfaces in contact with feed. 3/16" thick steel on drive unit. Chain tightens on idler end and drive end. Overall Width 13". Trough Width 11 1/2", Overall Depth 16". Trough Depth 8". Lengths Up To 150'. 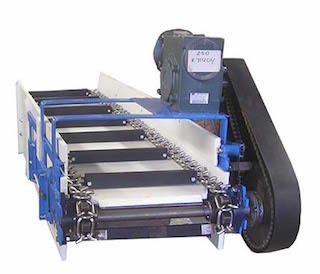 14" belt feeders for single or divided lot operations. 18" belt feeders for multi-lot operations. Direct drive gearbox reduces maintenance. 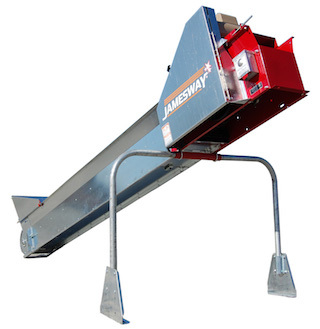 Exclusive Jamesway chain system eliminates the constant adjustment required by cable drive systems. 2-1/2’, 5’ and 10’ 16 gauge galvanized steel sections available. Heavy duty motor mount and stainless steel adjusters make system easy to maintain. Floating V-plow allows for side-to-side switching for single or split lot feeding. Chain drive for reliable performance. Choose either T-stands or arched stands to support feeders. 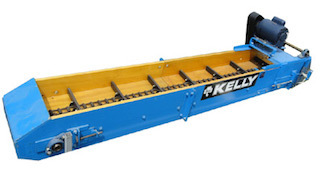 Chain attaches under the plow with a Pitman arm which follows the chain the length of the feeder, reversing direction as it rounds the drive and idler sprocket. Chain tension is easily adjusted. High capacity 16" wide belt conveys any type of forage, ground feed or TMR at high speed and low horsepower up to 180 feet. Smooth belts are available for up to 15 degree inclines. Textured belts are available for up to 30 degree inclines. 10, 5 or 2.5 ft sections with extra wide galvanized splices. Incline or decline sections available. The intermediate sections are available in 8 ft. 3 ft or 1 ft length. “Snap-in” upper pans makes replacement a snap. The strong and simple double reduction drive is reliable in all conditions. The galvanized shield is hinged for easy service. This workhorse has a unique shaped tail assembly that prevents jamming and virtually eliminating bent paddles. The tail is 100% galvanized and the bolted wrapper band is easy replaceable. The heavy duty section are fully enclosed for weather protection and safety. The riveted construction is stronger than competitive formed sections and the interlocking finger joint prevent chain snagging. Drop in wear liners are available. The unique "zero-maintenance" design requires no lubracation, no ajustements and has no bearings or sprockets to replace. The 16" wide upper deck is covered with UHMW and the galvanized sides flare to 20" wide at the top. The chains run under full lenght hold-down bars. The incline elbow is heavy duty, with inspection doors. It includes galvanized cover. 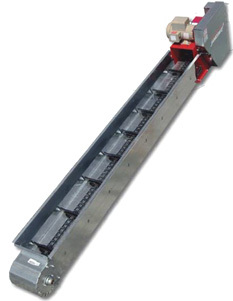 The drive section includes tensioners for conveyors chain. Fully enclosed drive includes covers. 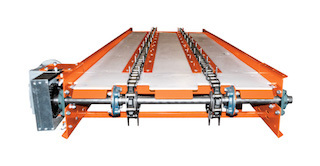 Part of an automatic feeding system, this conveyor is designed to carry slowly big square bales. 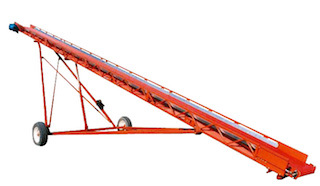 This type of conveyor, carrying bales at 24 ft/min - 7,5 m/min on short distance, allows to feed a big bale chopper, such as a bale processor or a vertical mixer. 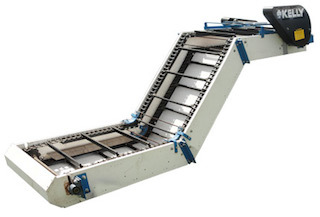 Part of an automatic feeding system, this conveyor is designed to carry slowly big round bales. 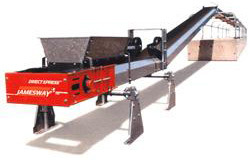 11 1/2 inch chain conveyor. Reliable, robust and versatile! Ten different models to choose from plus lots of accessories to fit your needs. Available in 14", 18", 24", 36" & 48". Versatile, no matter the configuration of your barn. Ideal to transport feed where you want. A tough polester belt with P.V.C. coating maintains flexibility in sub-zero weather for year round performance. 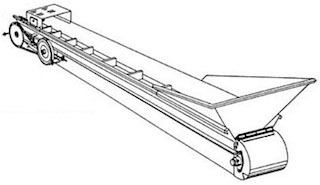 Concave belt provides high volume conveying capacity, uniform delivery and no feed separation. 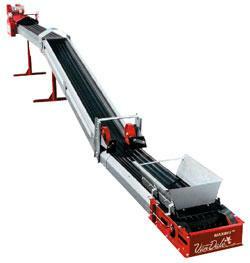 The Valmetal cleated belt conveyor ease unloading in a DAF feeder robot (an automated ration distributor) or in a motorized cart. The cleated belt help overcome strong inclinations up to 45 degrees and sometimes more. 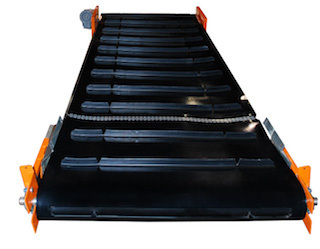 The conveyor can be installed at 45 degree angles. 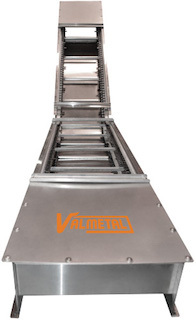 The Valmetal feeder conveyor allows you to feed your herd with exceptional quality feed thanks to its ingenious operation, the low maintenance requirement and high level efficiency. From the mixer to the cow, the TMR keeps its uniformity and its consistency. All forage, grains, protein supplements, vitamins and minerals remain mixed as during the unloading, regardless of the length of the travel. 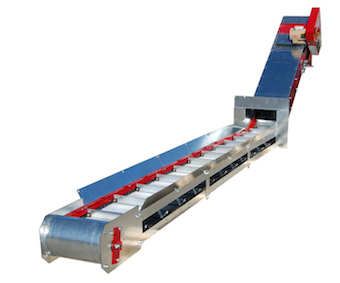 A new generation of stainless steel conveyors to deliver a perfect TMR. 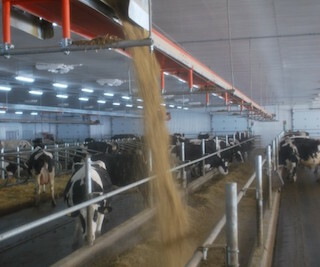 Best conveyor ever to regulate the flow of your feeding. 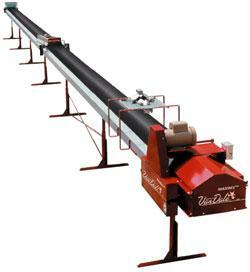 Ideal for feeder conveyors, silent, low maintenance.